One of the keys to success in cyclocross is the execution of a series of routines. Starting long before the day you race, preparation is absolutely key. On race day, one routine shared by many is a planned warm-up, and it’s not uncommon for riders to bring a stationary trainer in order to eliminate variables. Unfortunately, trainers have a lot of downsides. They’re heavy, for one, so you don’t want to go carrying them around the venue. They also don’t always play nice with thru-axles and, unless you have a direct drive trainer like a Wahoo Kickr or CycleOps Hammer, they accelerate tire wear. 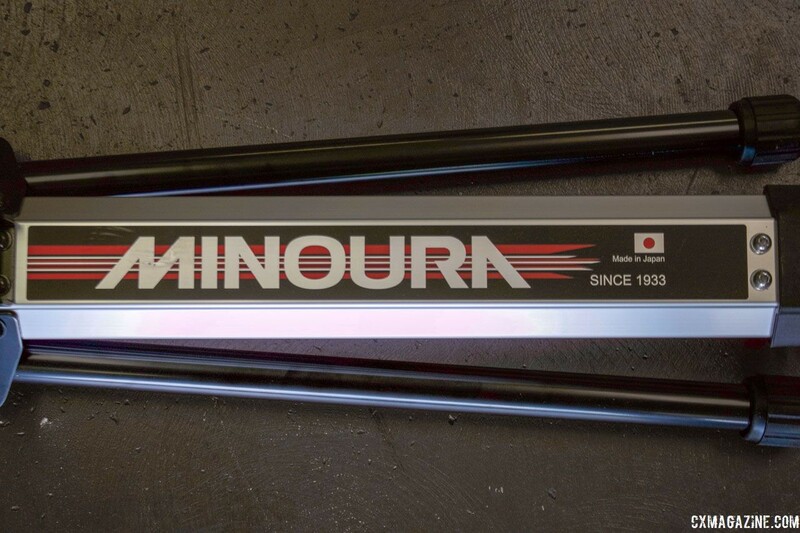 Minoura has been producing bike products since the 1930s, and in 2017, it launched the Live Ride FG 220 portable hybrid rollers attempt to address some of the issues that come with using a trainer or rollers for race-day warm-ups. 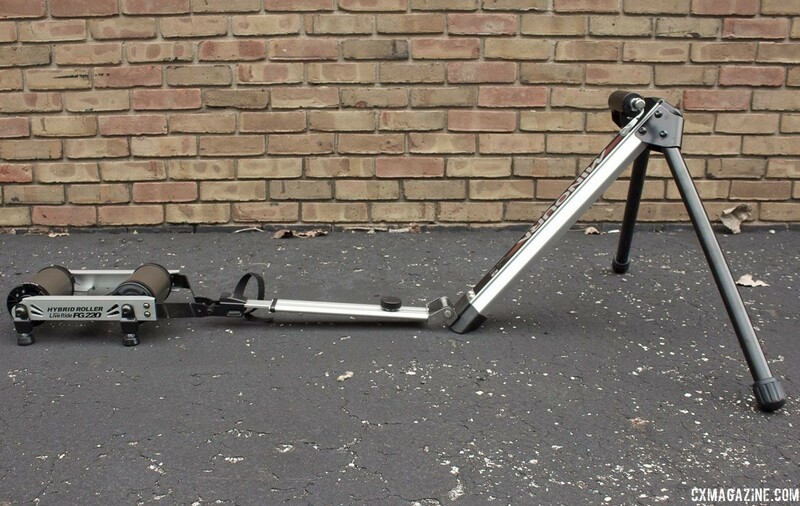 Highly similar to the Feedback Sports Omnium Over-Drive Portable Trainer (reviewed here), the FG 220 uses a pair of rollers attached to a folding framework. 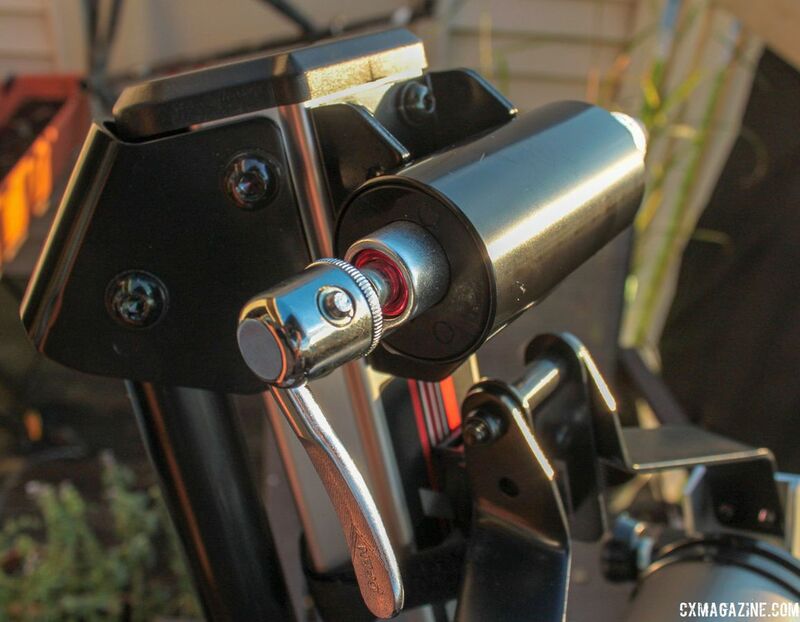 Like the Feedback unit, your bike mounts by the fork dropout, and the mount is convertible to accommodate 15mm thru-axles and quick release skewers out of the box through the installation of different inserts. The omission of a 12mm adapter is somewhat inexcusable for a product launched in 2017, but Minoura has stated an adapter will be included starting in 2019. For my testing, I used an adapter intended to convert 15x100mm hubs to work with 12x100mm thru-axles in conjunction with the supplied 15mm insert to make the trainer fit my 12mm thru-axle bike. 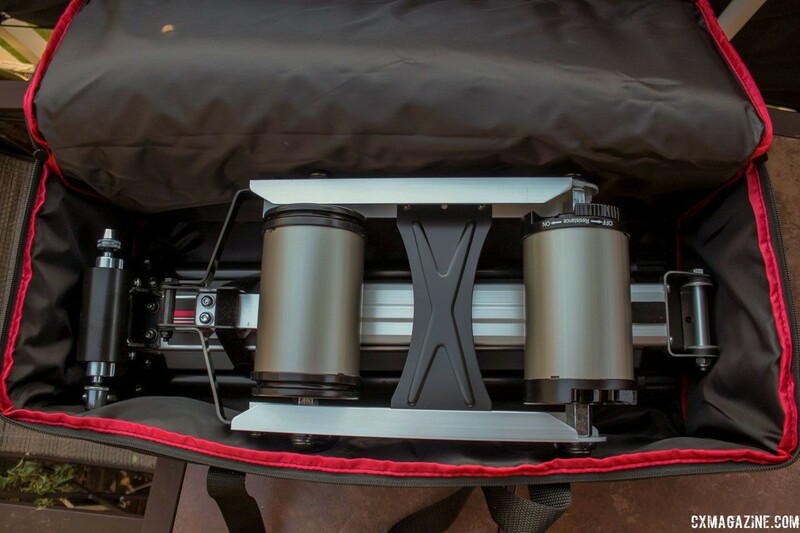 The whole unit folds on itself and fits neatly into a padded bag about the size of a small duffel that was designed to fit in overhead bins on airplanes. Packed with a multi-tool in the bag—not included but handy for tooled axles—it weighs a scant 12.5 lbs with the bag, which is over a pound lighter than the Omnium. Out of the box, the unit seems sturdy and well built. The majority of the frame is aluminum, although the joints and front legs are steel. Wheelbase adjustments are made by sliding the rollers further or closer to the front axle mount and a knob locks down the position. There is no form of reference marker through the range of adjustments, so users with multiple bikes may need to make marks on the track to allow easy adjustment in the future. 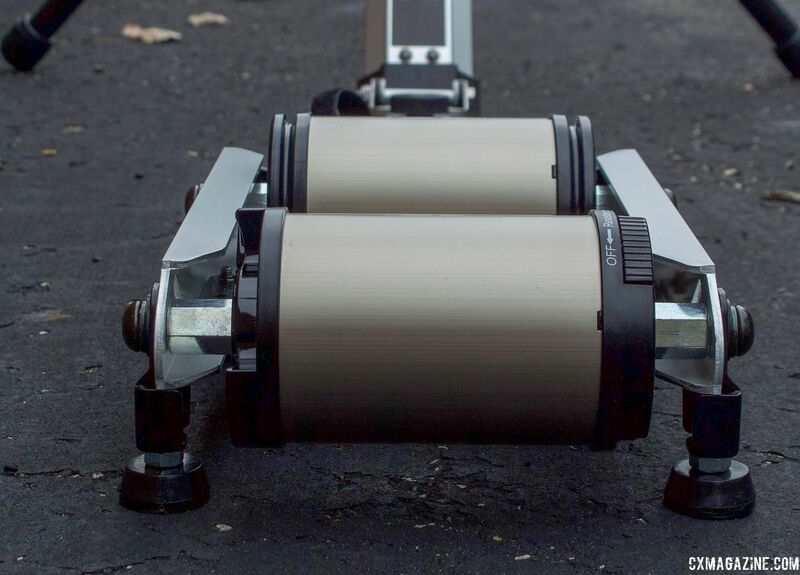 The roller unit itself is comprised of two drums which measure 3.1” in diameter on my digital calipers. The rear contains a magnetic resistance unit with a max resistance of 320 watts—which is plenty for a trainer focused on pre-race warm-ups—that can be toggled on or off with a slider on the roller itself, which is one advantage over the always-on Feedback Sports Omnium. Housed in a mostly aluminum frame, the drums rest on four feet which can be turned to level the frame. This was a welcome feature when using the unit on uneven ground, and it helped keep the rear wheel centered on the roller. Curiously, no leveling provision is made for the front axle legs which can make for an unbalanced sensation front to back if the ground is not consistent. I have tested the FG 220 through this race season, using it for warm-ups, cool-downs and as a stationary trainer at home. 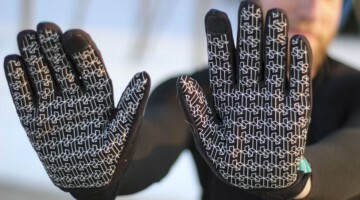 In its intended use it really shines, simplifying warm-up routines and making race packing much easier. 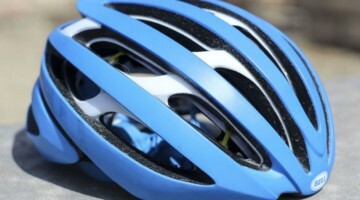 When packed in its bag, the Live Ride FG 220 nearly disappears inside a car. The bag is easy to transport and the whole assembly is light enough to carry while riding a bike in the event parking is somewhat disjointed from the course. 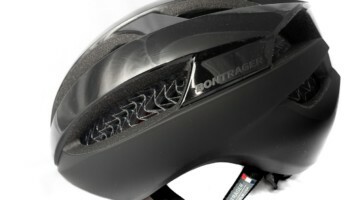 Once you remove it from the bag, it unfolds in seconds and it’s only a matter of mounting the bike to get to warming up. This ease of setup has also proved a blessing when trying to mount the bike in cold weather for a post-race spin-down. Packing is just as easy, and the frame has an integrated velcro strap to keep the whole thing folded, although it seemed redundant given I was about to insert it in the carrying bag. Riding the trainer, I was struck by the smooth feel of the rollers and overall low noise of the unit, a feature Minoura was quick to point out. I was able to watch Netflix on a tablet without headphones and could still understand every bit of the Great British Baking Show without subtitles. Unlike some rollers, the FG 220 does not create a static charge that prevents the use of earbuds should you need them. For all the things the FG 220 does well, there is some room for improvement. First is the omission of a 12mm adapter, although Minoura appears to be addressing the issue. I would love to see leveling feet added to the front of the frame as well. 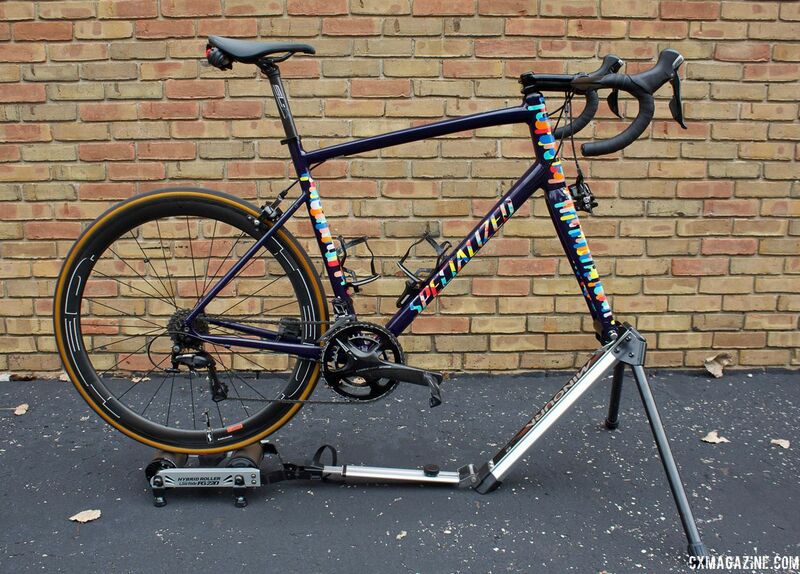 As with the Feedback Omnium, there is only so much that can be done with a lightweight body and small rollers when it comes to out of the saddle riding. 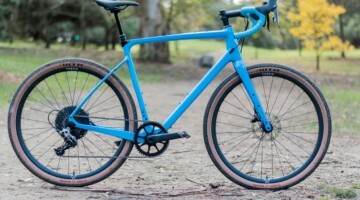 Under hard efforts, the frame flexes notably, although it does not feel flimsy or disconcerting in any way, and there is a notable loss of inertia in the rollers when pedaling a low cadence. The front legs lack the support struts found on the Feedback Omnium, although I never once found myself wishing legs were better supported. My final issue has to do with the resistance unit itself. While riding at the upper limit of its power curve for several minutes, the resistance unit made an audible knocking noise in sync with the rotation of the roller, making a click a few times per revolution. 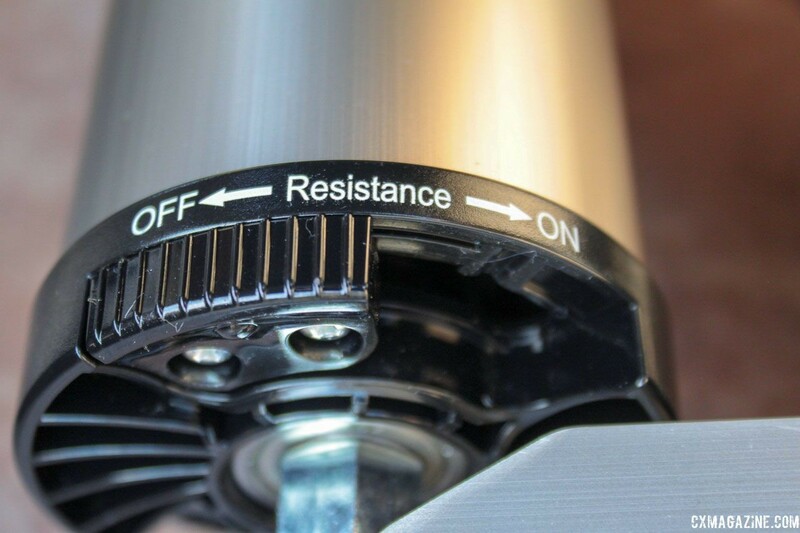 It would go away if the resistance was disabled and has come back intermittently since. Closer inspection inside the roller didn’t show anything obviously loose and the trainer has continued to function otherwise. Something similar happened with a Cycle Ops Magneto I was using in the past, so I am inclined to believe it may be something inherent to magnetic units. Stay tuned for more on this as I try to figure out what is causing the noise. As a package, the FG 220 provides a good solution to the portability and ease-of-use problems inherent to trainers and rollers. I found it quick to set up, easy to use, and (mostly) quiet enough to use in the context of a team tent without dominating the soundscape. It practically disappeared in my car, a major improvement over the rollers I typically drag around. Priced at $329 the Live Ride FG 200 is almost $100 cheaper than its competition but still seems solidly built and well suited to the task of warm-up riding. Its small form factor and light weight also make it an ideal travel companion for the rider who often finds themselves on the road. While the lack of a 12mm adapter presently requires a workaround, it's future inclusion will make the FG 220 a compelling package for anyone looking for a highly portable trainer.